Last Thursday, James Mattis, the Defense Secretary, published a public letter concluding that the decline of the American industry as a result of unfair trade posed a threat to national security, a position aligned with the Commerce Department’s. But he urged the administration to proceed cautiously, particularly with regard to allies. The Defense Department “continues to be concerned about the negative impact on our key allies regarding the recommended options within the reports,” Mr. Mattis wrote. He urged the administration to consider tariffs targeted at specific countries and to focus on what he described as the underlying problem — Chinese overproduction. Yet the United States could face a challenge in crafting trade sanctions that circumvent allies and target China. It has already imposed a variety of restrictions on Chinese aluminum and steel. But American steel and aluminum producers argue that China still harms them indirectly by routing goods through third countries, as well as depressing global prices to a level where American manufacturers cannot compete. Although China has promised to cut its steel and aluminum capacity, it has made only slow, modest progress. That is why some American metal makers have argued for broader protections. Canada accounted for more than half of American imports of aluminum in 2016, followed distantly by Russia and the United Arab Emirates. Canada also made up the largest share of American steel imports in 2016 — 17 percent — followed by Brazil, South Korea, Mexico and Turkey. China did not rank among the top 10 suppliers of either metal. Canada’s inclusion in the Commerce Department recommendations was unexpected, in part because companies and workers have been relatively united in calling for the country to be exempted. The operations of many metal makers — as well as the United Steelworkers, their largest union — stretch across the border. Under law, Canada is included as part of the United States defense industrial base, and the growth of its aluminum industry dates back to supporting the United States during World War II. Ken Neumann, the national director of United Steelworkers, struck a similar note. “There is no justification to include Canada with countries that systematically violate trade laws and engage in the dumping of illegally subsidized aluminum and steel,” he said after the release of the Commerce Department report. Canada is one of several allies that could be affected. Britain, Australia, Europe and Japan would also be included under the kind of blanket tariff or quota recently floated by the Commerce Department. The measures could fall particularly hard on South Korea, which was named as one of the countries that would face a 53 percent tariff on its steel exports, along with China, Brazil, India, Russia, Turkey and six others, under one potential scenario in the report. The United States has been seeking South Korea’s cooperation to combat a nuclear threat from North Korea. But the Trump administration has simultaneously pursued the country on trade, largely because South Korea maintains a large trade surplus with the United States. The administration is renegotiating its free trade deal with South Korea, and the country was a target of an earlier tariff on washing machines. Including countries like Canada could lead to unintended ramifications for the United States military and economy. 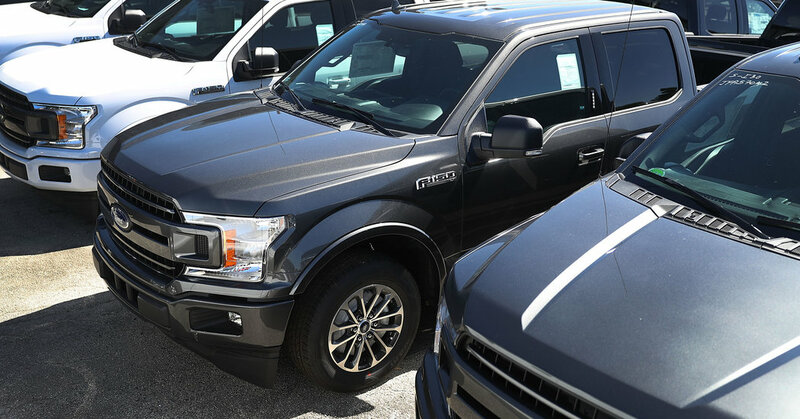 Many products made in America use foreign metals, including the Ford F-150, a classic American truck that is consistently ranked as one of the most “made-in-America” vehicles in an industry known for sourcing parts from around the world. The truck’s engine and transmission are American-made, and the truck is assembled in plants in Dearborn, Mich., and Claycomo, Mo. Even so, the truck is made of Canadian aluminum, some of which comes from Rio Tinto’s aluminum works in Quebec — an area with plentiful hydropower, which is needed for the energy-intensive process of producing aluminum. From Quebec, some aluminum travels to a plant in upstate New York owned by Novelis, which combines it with recycled aluminum and rolls it out into wide sheets for Ford. Another 15 percent of the value of the truck’s components come from Mexico. Its window wipers come from a factory in Matamoros, some of its wheels from Chihuahua, and some of the pistons in its engine from Ramos Arizpe. The auto industry says this web of North American suppliers allows it to produce cars and trucks at a quality and a price to compete with products made around the world. Ford exports the truck back to Canada, and last year it announced that it would begin exporting vehicles to China as well. Economists say the companies that make aluminum into car bodies and soda cans employ far more people than the smelters that make raw aluminum itself. Novelis, which specializes in recycling and rolling aluminum out into sheets, announced in January that it would invest $300 million to open a new factory in Guthrie, Ky., to make the aluminum sheeting used in cars. The same trends are true in the steel industry. In mid-February, 15 American industry associations that buy steel to make their products wrote a letter to Mr. Trump arguing that, by raising the price of steel, restrictions on imports could do more harm than good. They said they represented more than one million jobs in the United States, compared with about 80,000 jobs in primary steel production. Other economic forces are driving aluminum smelting from the United States. Aluminum manufacturing is extremely energy intensive, so it has tended to go to parts of the world with cheap excess energy, like the Middle East, Iceland and Canada. Smelters in the United States must compete with other, more profitable businesses for electricity, like computer server farms.